Nancy Holzner earned a Ph.D in English and began her career as a medievalist, then jumped off the tenure track to try some other things. 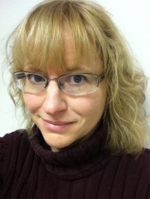 Besides teaching English and philosophy, she’s worked as a technical writer, freelance editor and instructional designer, college admissions counselor, and corporate trainer. Nancy lives in upstate New York with her husband. She enjoys visiting local wineries and listening to opera. Visit Nancy Holzner’s website. Today we'd like to welcome Nancy Holzner author of the mystery novel Peace, Love, and Murder, and of the urban fantasy novel, Deadtown which is on sale today at bookstores everywhere. Nancy will be hanging around after the interview -- or at least checking in throughout the day to respond to your questions. And we will be giving away a copy of Deadtown to not one but two lucky commenters. 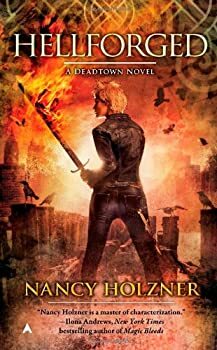 If you're a fantasy fan, you don't want to miss Deadtown; It's a fun, fast read. Deadtown — (2009-2014) Publisher: They call it Deadtown: the city’s quarantined section for its inhuman and undead residents. Most humans stay far from its borders — but Victory Vaughn, Boston’s only professional demon slayer, isn’t exactly human… Vicky’s demanding job keeping the city safe from all manner of monsters is one reason her relationship with workaholic lawyer (and werewolf) Alexander Kane is in constant limbo. Throw in a foolhardy zombie apprentice, a mysterious demon-plagued client, and a suspicious research facility that’s taken an unwelcome interest in her family, and Vicky’s love life has as much of a pulse as Deadtown’s citizens. But now Vicky’s got bigger things to worry about. The Hellion who murdered her father ten years ago has somehow broken through Boston’s magical protections. The Hellion is a ruthless force of destruction with a personal grudge against Vicky, and she’s the only one who can stop the demon before it destroys the city and everyone in it. 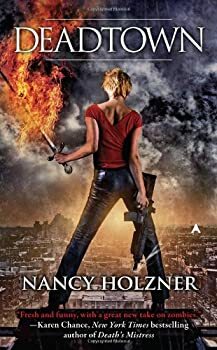 When FanLit interviewed Nancy Holzner last month, I thought she sounded so nice, and her debut, Deadtown, sounded awesome. While shopping that night at my local Wal-Mart, I noticed Deadtown on the shelf, so, naturally, into my cart it went, and I started reading as soon as I got home. After a mysterious plague strikes Boston, its fallout area becomes known as Deadtown. Deadtown residents are controlled by the state of Massachusetts — they have few rights and must carry identifying papers when they move about the various zones. Paranormals are segregated, creating a racially tense atmosphere that underlies the whole story. After saving the world from the clutches of the Destroyer Demon and its evil puppeteer, Victory Vaughn is finally falling back into the routine of professional demon hunting. Victory pays the bills by exterminating the myriad of demons that inhabit the Deadtown world. While on a routine case Victory is paid a visit in a dream by the Destroyer she thought she had banished. She might have been able to handle the fact that the Destroyer has returned, but that’s not quite all... Every time the demon stops by to say hello and deliver an evil message, someone close to her bites the dust. Victory has to piece it all together. Her friends are dying and she’s running out of time. What makes a great female protagonist? Today I will be handing over the Thoughtful Thursday reins to Nancy Holzner, author of the DEADTOWN series. Nancy is one of my favorite authors, and her razor sharp writing raises the bar in urban fantasy. It’s a an honor and a pleasure to have her guest post for today’s column.